K’ril Tsutsaroth is a Greater Demon boss in the God Wars Dungeon. His primary attack is melee, he has a strong secondary magic attack, and the three minions in the boss room also attack with all three combat styles, melee, ranged and magic. For this reason, it’s impossible to negate all damage with protection prayers (unless you are extremely skilled at prayer flicking). K’ril Tsutsaroth has two unique attacks, one will inflict a strong poison on the player which starts at 16 damage. The other is a prayer smash attack, which he will only use if his target is using the protect from melee prayer. This attack can hit up to 49 damage and drains your current prayer points by 50%. The most common tactic to use at K’ril Tsutsaroth is to use melee, while wearing high defence armour, paying particular attention to magic defence. You can then use the protection from melee prayer to negate all of K’ril Tsutsaroth’s melee attacks. 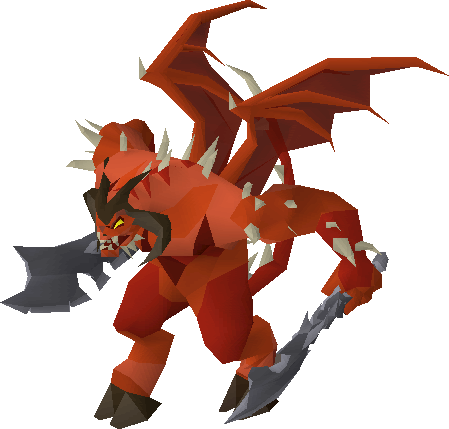 As K’ril Tsutsaroth is classed as a Greater Demon, a slayer task of Greater Demon will allow you to use a black mask or slayer helmet, which greatly increases your DPS and the number of kills you will be able to achieve in a single trip. The weapon Arclight is also extremely effective against K’ril Tsutsaroth. Due to the low prices of K’ril Tsutsaroth’s drops and his difficulty level – he is not often killed outside of slayer tasks. God Wards Dungeon Notes – You will need to bring one rope to gain access to the dungeon for the first time and access to Zamorak’s corner of the dungeon requires you to have 70 hitpoints. When entering the dungeon, you will take damage from a variety of different monsters if you are not properly prepared. There are certain god-aligned items you can equip in order to give yourself protection from that specific god’s followers. For example, equipping a Bandos Godsword while in the dungeon will make all minions in the dungeon which are aligned with Bandos non-aggressive. The protection needed in order to have full protection in Zamorak’s corner of the dungeon is Bandos, Zamorak and Saradomin. However in Zamorak’s Fortress you will only need a Zamorak item to get your kill count and enter the Zamorak boss room comfortably. As a Melee Tank at K’ril Tsutsaroth, you should use the protection from melee prayer and keep your health and prayer points high at all times. K’ril’s prayer smash technique can hit up-to 49’s and drains 50% of your prayer points and is unblockable, combine that with frequent hits from the ranged and magic minions and the damage can stack up quickly. If your prayer happens to drop to 0 during one of these attacks you might be dead by the time you can re-activate your prayer. You can utilize the ‘step under’ technique in order to take fewer hits from K’ril Tsutsaroth. What you should do is hit K’ril twice, then immediately run under him so that he is unable to attack you until one of you move. This will give you a couple of seconds to eat if you need to, and then jump out from under him and immediately return to attacking. The Vengeance spell can be used to reflect some of the prayer smash damage back at K’ril Tsutsaroth, which will help speed up kills. You can swap out the Dragon Warhammer for another decent spec weapon, like a Bandos Godsword or Crystal Halberd. As a DPS at K’ril, your role is to deal maximum damage while someone else tanks. You should use the protection from magic prayer, to negate all damage from K’ril’s magical attacks. The only damage you will take (provided the tank holds the agro) is melee and ranged damage from the three minions. You can swap out the Dragon Warhammer for another decent spec weapon, like a Bandos Godsword or Crystal Halberd. In your rune pouch bring runes for High Alchemy. As a DPS at K’ril, your role is to deal maximum damage while someone else tanks. You should use the protection from ranged prayer, to negate all damage from ranged attacks. The only damage you will take (provided the tank holds the agro) is melee and magic damage from the minions.